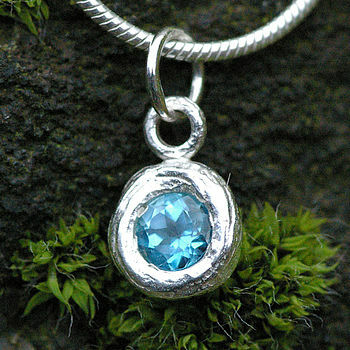 This beautifully simple blue topaz necklace is set within a circle of sterling silver, cast from a section of rose root.. This divine little necklace will appeal to the nature lover,and because of its scale can be worn on any occasion. The pendant measures approximately 6mm, and hangs delcateley from an 18" chain. As with all Anthony's work,this jewel will arrive in a beautiful recyclable cardboard box and pouch. All these products are ethically sourced,and the gemstones are from sources not invoveld in conflict.